Note: This policy brief was updated to reflect Louisiana’s cancellation of its August back-to-school holiday for 2018. Sales taxes are an important revenue source, composing close to half of all state tax revenues. But sales taxes are also inherently regressive because the lower a family’s income, the more the family must spend on goods and services subject to the tax. Lawmakers in many states have enacted “sales tax holidays” (18 states will hold them in 2018), to provide a temporary break on paying the tax on purchases of clothing, school supplies, and other items. While these holidays may seem to lessen the regressive impacts of the sales tax, their benefits are minimal. This policy brief looks at sales tax holidays as a tax reduction device. Sales tax holidays are temporary sales tax exemptions, usually applying to a small number of taxable items for a very limited period. These holidays are typically timed to take place in August during the traditional “back-to-school” shopping season and offer breaks on school-related items such as clothing, school supplies, and computers. However, a few states exempt all taxable goods during the holiday. Separate holidays for energy efficient appliances, guns and hunting season equipment, and storm preparation materials are becoming increasingly common as well, and one state (New Mexico) added a single-day “Small Business Saturday” holiday in 2018. Most sales tax holidays last only two or three days and almost all holidays apply only to items below some specified price (e.g. clothing items priced over $100 are generally not exempted). The notion of a holiday was first introduced in 1980 when Ohio and Michigan opted to not tax the sale of automobiles for a period of time. New York experimented with the current concept of sales tax holidays in 1996, but has since abandoned the policy. More than twenty states have enacted legislation at some point to provide holidays and proposals to extend the concept to more states and more types of purchases continue to appear each year. Many states either repealed or temporarily suspended sales tax holidays when facing significant revenue gaps. For example, lawmakers in Florida, Georgia, Maryland, Massachusetts and Washington D.C. all canceled holidays during the height of the Great Recession; and although most of these reinstituted them afterward, Georgia and Washington’s holidays have not been revived and Florida’s has only returned in a scaled-back form. Louisiana has pared back its use of holidays considerably due to recent budget woes, suspending its hurricane preparedness holiday for 2016 and limiting it to a partial exemption in 2017 and 2018, applying similar limits to its holidays for back-to-school shopping and hunting season for 2016 and 2017, and ultimately cancelling its back-to-school holiday for 2018. Holidays in Illinois, New York, North Carolina, West Virginia, and Vermont were also either short-lived or repealed. 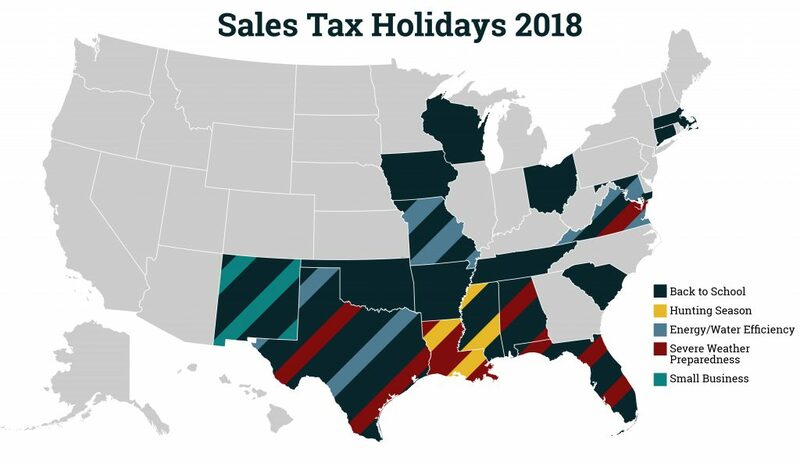 After a few years of states generally reducing their use of sales tax holidays, 2018 saw some states expand the practice. Ohio and Wisconsin enacted back-to-school holidays, Massachusetts made its holiday permanent, and New Mexico added the first state-wide post-Thanksgiving “small business Saturday” holiday. Policymakers tout sales tax holidays as a way for families to save money. On the surface, this sounds good. However, a two- to three-day sales tax holiday for selected items does nothing to reduce taxes for low- and moderate-income taxpayers during the other 362 days of the year. Sales taxes are inherently regressive. In the long run, sales tax holidays leave a regressive tax system unchanged, and the benefits of these holidays for working families are minimal. Sales tax holidays also fall short because they are poorly targeted, cost revenue, can easily be exploited, and create administrative difficulties. Because wealthier taxpayers also benefit from sales tax holidays, they offer less “bang for the buck” from a fairness perspective than more targeted tax breaks such as low-income sales tax credits (described in ITEP Policy Brief, “Options for Progressive Sales Tax Relief”) or Earned Income Tax Credits (described in ITEP Policy Brief, “Rewarding Work Through Earned Income Tax Credits”). Wealthier taxpayers are often best positioned to benefit from the holidays since they have more flexibility to shift the timing of their purchases to take advantage of the tax break–an option that isn’t available to families living paycheck to paycheck. Many low-income taxpayers spend most or all of their income just getting by, which means that they also have less disposable income than wealthier taxpayers to spend when the holiday arrives. One recent study found that while households that earn more than $30,000 were likely to shift the timing of their clothing purchases to coincide with a sales tax holiday, but households earning less than $30,000 were not. The benefits of sales tax holidays are not limited to state residents but instead extend to anybody who happens to be within the state’s borders at the time of the holidays, including tourists and individuals who live close to the border. In 2018, these holidays will cost states and local governments around $300 million. Revenue lost through sales tax holidays will ultimately have to be made up somewhere else, either through painful spending cuts or increasing other taxes. Retailers can also take advantage of the shift in the timing of consumer purchases by increasing their prices or watering down their sales promotions during the tax holiday. The influx of shoppers gives them economic incentive to do so, and the evidence suggests that they often do. One study of retailers’ behavior during a sales tax holiday in Florida, for example, found that up to 20 percent of the price cut consumers thought they were receiving from the state’s sales tax holiday was actually reclaimed by retailers. Sales tax exemptions create administrative difficulties for state and local governments and for retailers who must collect the tax. For example, exempting groceries requires a sheaf of government regulations to police the border between non-taxable groceries and taxable snack food. A temporary exemption for clothing (or for any other back-to-school item) requires retailers and tax administrators to wade through a similar quantity of red tape for an exemption that lasts only a few days. Further complexity can arise in states with local sales taxes when some localities opt not to participate in the holiday and consumers unexpectedly end up paying local sales taxes on their purchases. Sales tax holidays are poorly targeted and too temporary to meaningfully change the regressive nature of a state’s tax system. Lawmakers must understand that they cannot resolve the unfairness of sales taxes simply by offering a short break from paying these taxes. If the long-term consequence of sales tax holidays is a higher sales tax rate, low-income taxpayers may ultimately be worse off as a result of these policies. Policymakers seeking to achieve greater tax fairness would do better to provide a permanent refundable low-income sales tax credit or Earned Income Tax Credit (EITC) to offset the impact of the sales tax on low- and moderate-income taxpayers. More detailed information is provided in the attached table. U.S. Census Bureau, U.S. Census Bureau, 2016 Annual Survey of State Government Finances. Janssen, C. B. (2012), (Un) Happy Holidays: The True Meaning of Sales Tax “Holiday” Policy, Loyola Consumer Law Review. 24: 411–440. Marwell, Nathan and Leslie McGranahan (2010), The Effect of Sales Tax Holidays on Household Consumption Patterns. Federal Reserve Bank of Chicago. Brunori, David (2017), Sales Tax Holiday: Great Politics, Poor Policy. D.C. Policy Center, https://www.dcpolicycenter.org/publications/sales-tax-holidays-great-politics-poor-policy . Harper, R. K., Hawkins, R. R., Martin, G. S. and Sjolander, R. (2003), Price Effects around a Sales Tax Holiday: An Exploratory Study. Public Budgeting & Finance, 23: 108–113.